Osteopenia and osteoporosis are bone and tissue diseases leading to low bone mineral density (BMD). Low BMD weakens the bone and increases the risk of fracture in the lower back (lumbar spine), hip and forearm. Osteopenia/osteoporosis affects both men and women, but it is more common among aging women. Estrogen also plays a large role in calcium absorption. Research data indicate that calcium is helpful in maintaining BMD, or strong bones and vitamin D is also important for calcium absorption. A high calcium (at least 1,200 milligrams per day) and adequate vitamin D diet is important in the prevention of bone loss among aging women. 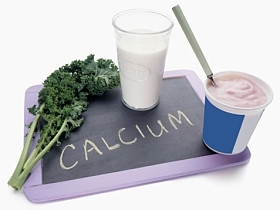 Increasing calcium in your diet should be the first line of defense in preventing bone loss. As a registered dietitian, I recommend having low-fat yogurt with breakfast, because one container of yogurt can have 300-500 milligrams of calcium. I try to have cheese (one ounce has 200 milligrams of calcium) or low-fat cottage cheese for lunch (a half cup contains 77 milligrams of calcium) and drink low-fat milk with dinner (one cup provides 300 milligrams of calcium). Green leafy vegetables are also high in calcium: One cup of spinach contains almost 250 milligrams of calcium, while a cup of kale has almost 100 milligrams. Other excellent sources include canned sardines (325 milligrams per 3 ounces), canned salmon (180 milligrams per 3 ounces), almonds (160 milligrams per half cup), soybeans or edamame (200 milligrams per half cup) and chickpeas (105 milligrams per cup). If you are not able to consume enough calcium in the foods you eat, it is best to use a calcium supplement; 500 mg of calcium should be taken either once or twice per day to maintain adequate calcium intake. Calcium carbonate is the most common and least expensive calcium supplement. Research suggests that absorption of calcium from calcium carbonate is similar to the absorption of calcium from milk. Sarah Peterson, MS, RD, CNSC, is a clinical dietitian at Rush University Medical Center. ..Where can I find a dietitian who works with people who have osteoporosis or dont get enough calcium?…. Research does not support some of the recommendations she made including the one about bone meal for a calcium supplement.